Clean & Protect your capital investments with this super effective concrete dissolver, the most powerful & effective concrete dissolver available! How Does SpeedyClean Concrete Dissolver Work? 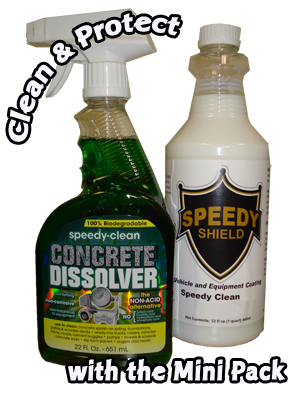 SpeedyClean Concrete Dissolver works by attacking and dissolving the "glue," or Portland, in concrete. It deconstructs the bond between the portland and the other ingredients such as sand or gravel. It turns the material into a soft mush which does not require hazardous waste disposal. 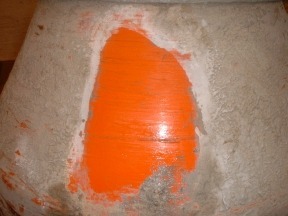 The amount of time required for this process is strictly proportional to the thickness of the concrete being dissolved. Does SpeedyClean Concrete Dissolver Contain Acid? SpeedyClean Concrete Dissolver is acidic the way a lemon or an orange is. There is no muriatic or sulphuric acid in SpeedyClean Concrete Dissolver. How fast does Speedy Clean CONCRETE DISSOLVER work? SpeedyClean Concrete Dissolver normally works in 10 to 15 minutes depending on the application. The amount of soak time will really depend in the thickness of the material trying to be removed. The minimum should be about 10 minutes but thicker materials may take 30 or more and repeated applications. It is important to keep the material wet with the concrete dissolver and not let it dry. Do I wet with water the items to be cleaned or etched? DO NOT wet material before applying SpeedyClean Concrete Dissolver ever. You must apply it to the material when it is dry. Any water on the material will neutralize the effects of the concrete dissolver and it will not work. There are some simple guidlines to follow when using SpeedyClean CONCRETE DISSOLVER to clean your hand tools and equipment. SpeedyClean is best applied with a Foamer which allows for the chemical to adhere to the surface and allows for a longer contact period. It also helps volumize the chemical so that goes further. We have several types available including manual hand foamers to compressed air powered foamers that make cleaning tools and equipment straightforward. It is neutralized by water, so do not wet tools or equipment first. If you are cleaning equipment on concrete, cover or wet it down first. Always allow 10 to 15 minutes of continual soaking by the product. After a good soaking with SpeedyClean use a stiff nylon brush and water. The thickness of material will dictate if a second treatment is required. A 2 gallon sprayer or preferably a foamer is a very effective applicator. Some tools can be soaked in trays for 30 minutes or so. After using the stiff brush, wash off with a hose or a pressure washer. Though SpeedyClean is a nontoxic, biodegradable product, we always recommend that you wear protective gloves and eye protection. Fumes are minimal and not harmful so a respirator is not required. We do however urge anyone with respiratory issues to wear one. SpeedyClean Concrete Dissolver is an excellent pretreatment to etch concrete for increased bonding capabilities. Below are some guidelines to follow. Test a small area first to establish how much soak time is needed. When the time needed is determined, apply to rest of area with a sprayer. When the etching time is up rinse with water to neutralize. Let area dry to the state needed by material being used. Try out both our shield and concrete dissolver in a convenient mini pack. Sample both the speedy shield concrete plant and formwork protector in a 946ml applicator that creates an invisible barrier to prevent mortar adhering to the surface of your equipment; and the Speedy Clean Concrete Dissolver in a 625ml applicator that rapidly dissolves concrete and mortar splatter. Both available at great £24.99!